Our mission is to educate the public about the problems with pesticides, how they affect the wildlife food web and our total environment, and to offer viable solutions. Pesticides are in the air we breathe, the water we drink and the food we eat. The overall health of our children, pets, wildlife and environment is our goal. Got Weeds or Invasive Species? Poison Free Businesses – Thank you! Recent laws and regulations restricting rodent poisons. Thank you to our good friends Karma Dealers who wrote and sang this song for us! Found in Point Mugu State Park. Link to NPS report here. Owl family near Chatsworth Nature Preserve. Baby owls are bleeding. All three were later found on the ground dead. P-22 had been featured in National Geographic Magazine. Click HERE for a Los Angeles CBS news video on P-22. A National Public Radio story here. The National Park Service press release detailing how 1st generation anticoagulant rodent poisons were the culprit is here. The 2nd generation anticoagulants are the only ones recently banned for consumer use, but this is an indication that the 1st generation anticoagulants are also doing tremendous harm. Sick with mange caused by 1st generation anticoagulant rodent poisoning – diphacinone and chlorophacinone. Malibu is adjacent to thousands of acres of National, State, County and City Parks and other preserved natural land. Modern supertoxic rodent poisons are spreading throughout the ecosystem causing massive exposure, disease, and death beyond the intended targets. Our goal is to have all the communities surrounding our mountains taking strong stands against the poisoning that is now occurring. Scientific studies tell us that rodent poisons are a leading cause of death among carnivores. Rodent poisons kill the targeted species, but non-targeted species as well. The animals in the food chain consuming the poisoned rodents include – Golden Eagles, Great-horned Owls, Barn Owls, Hawks, Kestrels, Turkey Vultures, Black bears, Pigs, Fishers, Foxes, Badgers, Snakes, Skunks, Raccoons, Bobcats, Coyotes, Mountain Lions, among others. • Click here to watch (and share) a simple and effective 2 minute video by Steve Byerly of the Ventura County Star describing how the poisons go up the food chain. • Click here to watch a 14 minute video by Dr. Seth Riley, Wildlife Ecologist of the Santa Monica Mountains National Park Service and adjunct professor at UCLA. It is an excellent introduction to the science of what is happening. These are animals that we rely on to do our natural rodent control, and we are poisoning them. By killing owls and hawks, we are removing nature’s own rodent control system. A rodent dying from rodent poisoning is easy prey. Eating the poisoned rodents causes their consumers to bleed uncontrollably internally and die slow and agonizing deaths. The weakened immune system produces extreme emaciation, dehydration, and mange that can take weeks to kill the animal. There are extensive studies with overwhelming evidence of the carnage that rodent poisons have been causing nationwide and in our own surrounding Santa Monica Mountains. Here are some examples. Numbers in “[ ]” refer to documents in the Section “Technical and Academic Articles” below. – 83% of coyotes in the Santa Monica Mountains were exposed to rodent poisons . – 92% of bobcats tested in the Los Angeles area have been exposed to rodent poisons . 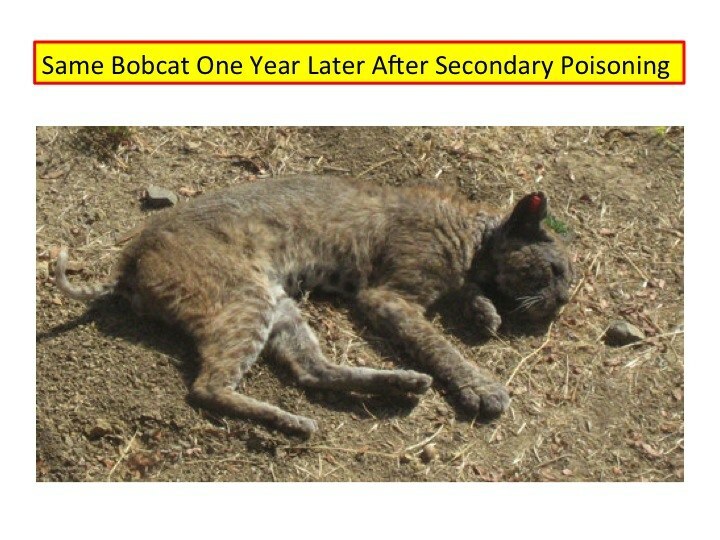 – The complete loss of bobcats from many open space areas in the Conejo Valley due to increased vulnerability to the deadly disease mange, caused by exposure to rodent poisons . – Survival rate (percentage that live from one year to the next) plunged from 77% to a low of 23% in 2004. The reduced population’s survival rate has recovered somewhat to 58% . – In a study of 195 bobcat blood samples in five southern California counties, the 1st generation anticoagulant diphacinone was found in 77% of the bobcats in which anticoagulants were detected. This emphasizes that the 1st generation anticoagulants are also doing tremendous harm, not just the more widely restricted 2nd generation poisons. See www.urbancarnivores.com/laurels-blog. Of 104 mountain lions tested California-wide from 2005 to 2011, 82 contained rodent poisons, with 78% containing more than one kind . A follow-up study in 2016 documented 95% of 111 mountain lions in 37 counties were exposed in one year. Of 28 mountain lions found in eight California counties that were tested between 1997 and 2011, 100% tested positive for at least one of the 2nd generation rodent poisons, 96% tested positive for brodifacoum, 93% tested positive for bromadiolone, 39% tested positive for difethialone and 61% tested positive for the 1st generation rodent poisons diphacinone. Note that this 1st generation anticoagulant is doing tremendous harm also, not just the more restricted 2nd generation anticoagulants. 14 out of 14 mountain lions tested by the California Department of Fish and Wildlife in 2012 had rodent poisons . – 2 Simi Valley mountain lions (P3 and P4) were documented to have died directly from rodent poison exposure. – October 2012 a young female mountain lion (P25) was found dead by hikers with rodent poisons in her system in Point Mugu State Park, Malibu. – September 2015 P-34 died in Point Mugu State Park, Malibu, from five different anticoagulant poisons. – October 2017 P-41 in the Verdugo Hills was found dead with six different anticoagulant poisons. – 85% found exposed to rodent poisons of 101 studied for exposure . Fishers are cat-sized weasel-type carnivores that live in the rugged portions of the southern Sierra Nevada and are candidates for listing under the Endangered Species Act. – 74% of 68 foxes sampled of this endangered variety studied near Bakersfield, California were exposed to anticoagulant poisons . This subspecies is listed as Federal Endangered and California Threatened, primarily due to profound habitat loss and degradation throughout its range. Current studies have proven that there are no safe poisons that can be used around wildlife, pets, and children. Approximately 10,000 children a year are accidentally exposed to mouse and rat baits, as graphically described in this Scientific American article. Ten rodent poisons have been identified by the US EPA as being particularly dangerous – Brodifacoum, Bromadiolone, Bromethalin, Chlorophacinone, Cholecalciferol, Difenacoum, Difethialone, Diphacinone, Warfarin, and Zinc Phosphide. They are specifically referenced in the US EPA document “Risk Mitigation Decision for Ten Rodenticides, May 28, 2008 (revised June 24, 2008)”. These and all other rodent poisons should be abandoned for rodent control in California. Fast Acting with No Antidote… Is Bromethalin Sitting Around Your Home? It is imperative that we do our part to stop the use of poisons to control rodents and to prevent these poisons from killing other species that feed on them. Dr. Laurel Serieys is a researcher at UCLA’s Department of Ecology and Evolutionary Biology. Her website is the place to start. A detailed 10-page summary of rodent poison types is here: Poison Types Summary. It includes anticoagulants and non-anticoagulants. First, please read the section in Laurel’s Urban Carnivores website No Poison Is A Good Poison (near the center of the long page). There is no poison that does not present a risk to wildlife, pets, and humans. At present, the strongest documented data points to anticoagulant rodent poisons as being the most damaging to wildlife. There are two categories of anticoagulants. LOOK AT THE PRODUCT LABEL to determine the type of poison. 1) Second generation. Products that have any of the following active ingredients are in this category: brodifacoum, bromadiolone, difethialone, and difenacoum. These are the most advanced, and dangerous, poisons. They are banned for consumer use in the United States, but are VERY commonly used by the professional pest control companies. – 1st Generation Anticoagulant Rodent Poisons are not the solution! 2nd generation anticoagulants get most of the bad publicity and blame for poisoning wildlife, but recent research suggests that 1st generation anticoagulants (diphacinone, chlorophacinone and others) are no better. Here is a handout we made summarizing the evidence concerning the far more abundant 1st generation anticoagulants. • We’ve got to get rid of these – poison bait boxes! Please help stop the use of poisons to control rodents and to prevent these poisons from killing other species that feed on them. The first step is to identify the poison bait boxes where the rodents load up on poisons and then leave, initiating the Chain of Death. Please see this TV news story to see the bait boxes at their worst. Green Rat Control. www.greenratcontrol.com Phone: 855-856-8585, greenratcontrol@gmail.com. Rodent Masters. www.rodentmasters.com Phone: (818) 855-9136, rodentmasters@gmail.com. Rodents Stop. www.rodentsstop.com Phone: (818) 583-7287, Contact: Contact Form. 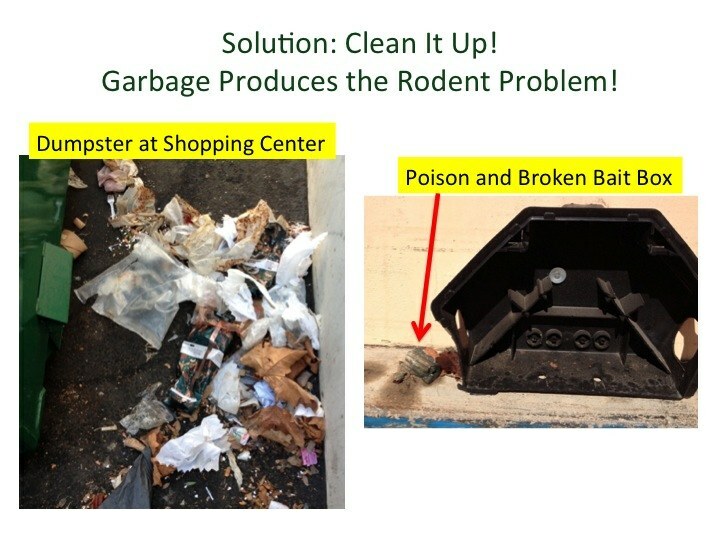 Our educational campaign resulted in Malibu merchants removing all rodent poison products from their shelves. There had been six – Ralphs, CVS Pharmacy, Pavilions, Malibu Hardware, A&B Plumbing, and Malibu Ranch Market. Ralphs, RiteAid, and Albertsons in Calabasas; and Agoura Feed and Roadside Lumber in Agoura Hills have also enthusiastically removed their poison products. Please THANK these local merchants! 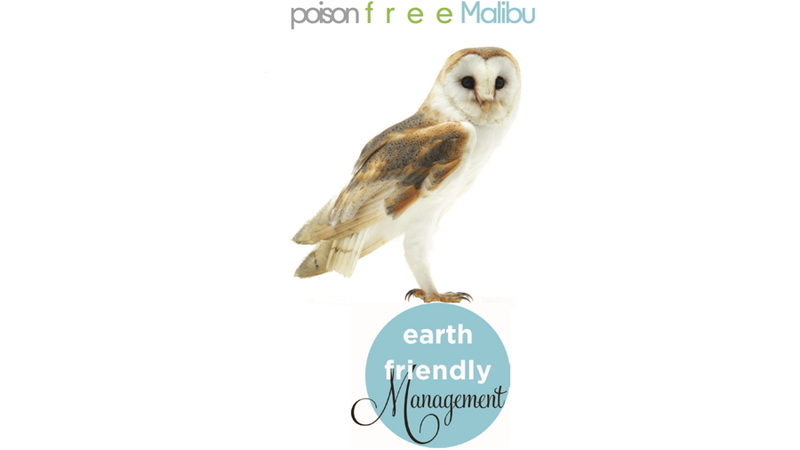 We would also very much like to recognize the following local Malibu businesses that do not use poisons, but instead use careful sanitation practices. They have no exposed garbage, no rodent problem, and no poisons! Please patronize and thank them! We also have noticed that businesses that do not clean up their garbage STILL HAVE RODENTS, NO MATTER HOW MUCH POISON THEY USE! Integrated Pest Management for Schools. – The Citizens for Los Angeles Wildlife is promoting an owl box program in the city of Los Angeles. See this link. 1) Several small holes should be drilled near the tops of the sides of the owl box to prevent overheating. 2) In areas with no shade, a second roof about 1.5 inches above the regular roof is a good idea for the same reason. 3) To prevent occupancy of owl boxes by bees, dust the inside with diatomaceous earth. The bees don’t like this fine white powder. In fact, it is used to repel many insects. – Take a look at this news video on barn owls successfully controlling rodents in Monterey County – Haute Enchilada restaurant inspires others to use a greener alternative than rat poison. – Ventura County Raptor Study – RAPTORS are MORE EFFECTIVE THAN POISONS for limiting rodent damage to dikes, dams, and levees. Flood control is very important in Ventura County. They must prevent burrowing rodents from damaging water flow structures. They did a careful study and now will the County will be removing poison bait stations and replacing with owl boxes and raptor perches. The Ventura County press release is here. The full 93 page study is here. A TV news video is here. Here is a YouTube presentation with slides by Karl Novak of the Ventura County Water Protection District to the Malibu City Council. Barn Owls are declining because of habitat loss and rodent poisoning. This Barn Owl could hear my heart beating. The Barn Owl has excellent low-light vision, but its ability to locate prey by sound alone is the best of any animal that has ever been tested. It can catch mice in complete darkness in the lab, or hidden by vegetation or snow out in the real world. A barn owl will eat at least 10,000 rodents a year. For every owl that dies prematurely from poisoned rodents, 10,000 extra rodents are free to multiply. The leader of this effort in northern California is Lisa Viani who heads up the Raptors Are The Solution organization. The mission of the TCWC is to preserve, protect and improve the health and well-being of the Topanga Creek Watershed by educating stakeholders to act in support of this valuable and fragile ecosystem. We actively promote non-toxic and bio-friendly solutions to environmental issues, and oppose the use of herbicides and pesticides. Why can’t any city or county control the use of rodent poisons or other pesticides? We get asked this all the time. This article explains how the agriculture and pest control industries put through a law preventing local cities and counties from regulating pesticides. It all started when Mendocino County tried to protect their children from being sprayed with herbicides. The agriculture and pest control industries fought Mendocino County all the way to the California Supreme Court and they LOST! So then their lobbyists went to the California Legislature and had a special law, called “Preemption” passed to take away the ability of local jurisdictions to control pesticides! We were delighted in September 2018 that the League of California Cities, the lobbying group for all the cities in California, passed a Resolution proposed by the city of Malibu to reverse preemption as it pertains to anticoagulant rodent poisons! It was just one of two Resolutions passed at its annual meeting. See Resolution 2 here – League of California Cities 2018 Resolutions. We will be working with the League to implement this with legislation. New rules banning 2nd gen anticoagulants from consumers use – July 1, 2014. Here is the official CDPR website stating and explaining the new July 1, 2014 regulations banning consumer use of 2nd generation anticoagulant rodent poisons. Includes technical arguments supporting the rule change in the document “Initial Statement of Reasons” and responses to public comment in “Attachment A” of Final Statement of Reasons. In November of 2018, the CDPR determined that these regulations were insufficient. No improvement in the rate of wildlife poisoning had been detected in the four years since the ban went into effect. The problem clearly was that commercial pest control operators had been exempted and could still use the 2nd generation poisons. A new reevaluation process in now in progress, see CDPR New Reevaluation. • New Santa Monica Mountains Local Coastal Plan banning all anticoagulant rodent poisons – October 10, 2014. All the details are here at planning.lacounty.gov/coastal/smm. • California Assembly Bills Restricting Rodent Poisons. We have been working with State Assemblyman Richard Bloom and allied organizations to further restrict rodent poisons in California. This is in progress. Our first attempt in 2017 was California Assembly Bill AB 2596. We had the support of a coalition of 57 conservation, public-health, research and wildlife-rehabilitation groups, the city of Malibu, Marin County, the mayor of Richmond and more than 45,000 people. This was followed in 2018 by AB 2422. It can be found here – AB 2422. It passed one Assembly committee. We have learned from this experience and are now working with a stronger team including professional lobbyists for the 2019 legislative session. – Blog by our great nature journalist for the Malibu Surfside News, Suzanne Guldimann. Here is the main page and two articles on rodent poisons and wildlife. Article from the Kansas Audubon Society illustrating how the process of collusion among the rodent poison chemical companies, academic researchers, and the EPA allow clearly damaging poisons to be applied for short term financial benefit. – It’s not just the California, or the USA. It’s all over the world. The Malibu Surfside News, its former Editor/Publisher Anne Soble, and its great environmental reporter Suzanne Guldimann are a major reason we started this campaign. – “Banning Rodenticides: The Next Hurdle” from the Malibu Surfside News, December 13, 2012. Editorial. – “Concerns about Rodenticide Impact on Wildlife Prod Efforts to Curb Use” from the Malibu Surfside News, December 6, 2012. Malibu Agricultural Society effort to stop sales in Malibu. – “Use of Rodenticides at High School Raises Issues of Health and Safety” from the Malibu Surfside News, September 15, 2011. – “Rodenticide information session draws out Malibu activists” from the Malibu Surfside News, March 17, 2014. 1) California Department of Pesticide Regulation on their new rules to ban consumer use of 2nd generation anticoagulant rodent poisons. BEST SINGLE SUMMARY and review of the latest data on the damage to wildlife in California. June 27, 2013 memorandum from Deborah Daniels, Senior Environmental Scientist to Ann Prichard, Chief, Pesticide Registration Branch, both of the California Department of Pesticide Regulation. 2) These are two long technical reports from a scientific panel reporting to the US Environmental Protection Agency. There is a lot of information not found easily elsewhere. In particular they discuss several different kinds of rodent poisons, including first generation anticoagulants, second generation, and non-anticoagulants such as bromethalin and strychnine. 4) Coyotes. Gehrt SD, Riley SPD. In book Urban Carnivores edited by SD Gehrt, SPD Riley, BL Cypher. Baltimore, MD: The Johns Hopkins University Press. pp. 79-95 (2010). b) Riley SPD, Boydston EE, Crooks KR, Lyre, LM. In book Urban Carnivores edited by SD Gehrt, SPD Riley, BL Cypher. Baltimore, MD: The Johns Hopkins University Press. pp. 121-138 (2010). c) Also, see Riley, SPD, et al, “Anticoagulant Exposure and Notoedric Mange in Bobcats and Mountain Lions in Urban Southern California,” Journal of Wildlife Management, 71(6):1874-1884 (2007). 6) Mountain Lions. July 11, 2011 Letter from John McCammon, Director, California Department of Fish and Game to Christopher Reardon, Acting Director of California Department of Pesticide Regulation. 2016 follow-up: J. Rudd, et al, Proceedings of the 28th Vertebrate Pest Conference, Rohnert Park, CA, February 2018. 7) Mountain Lions. Table 4, page 11 of June 27, 2013 memorandum from Deborah Daniels, Senior Environmental Scientist to Ann Prichard, Chief, Pesticide Registration Branch, both of the California Department of Pesticide Regulation. 8) Owls and Hawks (Raptors). Lima, L. L., and Salmon, T. P. “Assessing some potential environmental impacts from agricultural anticoagulant uses.” Proceedings of the Vertebrate Pest Conference 24:199–203 (2010). a) Gabriel, M.W., et al, “Patterns of Natural and Human-Caused Mortality Factors of a Rare Forest Carnivore, the Fisher in California“, Public Library of Science One, 0140640, #11, Vol. 10, November 2015.
b) Gabriel, M. W., et al, “Anticoagulant Rodenticides on our Public and Community Lands: Spatial Distribution of Exposure and Poisoning of a Rare Forest Carnivore.” Public Library of Science One, 0040163, #7, Vol. 7, July 2012. 10) “Potential Risks of Nine Rodenticides to Birds and Nontarget Mammals: A Comparative Approach,” William Erickson and Douglas Urban, US Environmental Protection Agency, July 2004. This 230 page report is an often cited classic in the field. 12) Cypher, B.L., McMillin, S.C. , Westall, T.L., Van Horn Job, C., Hosea, R.C. Finlayson, B.J. and Kelly, E.C., “Rodenticide Exposure Among Endangered Kit Foxes Relative to Habitat Use in an Urban Landscape. “Cities and the Environment 7(1): Article 8 (2014). 13) Ceballos, G., et al, “Accelerated modern human–induced species losses: Entering the sixth mass extinction.” Science Advances 19 Jun 2015: Vol. 1, no. 5, e1400253, DOI: 10.1126/sciadv.1400253. ” … the number of species that have gone extinct in the last century would have taken, depending on the vertebrate taxon, between 800 and 10,000 years to disappear. These estimates reveal an exceptionally rapid loss of biodiversity over the last few centuries, indicating that a sixth mass extinction is already under way.” — From the Abstract. 14) Pope Francis, ENCYCLICAL LETTER LAUDATO SI’ OF THE HOLY FATHER FRANCIS ON CARE FOR OUR COMMON HOME. “The destruction of the human environment is extremely serious, not only because God has entrusted the world to us men and women, but because human life is itself a gift which must be defended from various forms of debasement.” — One of many quotes beautifully describing the crisis we are in regarding climate change and our relationship to the Earth. 15) L Mott, D Fore, J Curtis, G Solomon, Chapter 5, Pesticides: Our Children At Risk, Natural Resources Defense Council, November 1997. Comprehensive summary of the effects of pesticides on children. Our team at work at an Earth Day event in Malibu. Mice and rats go in these boxes, eat the poison, and then go out to get eaten by and poison other animals. They DO NOT die and stay in the boxes! They take up to 10 days to die, making them easy prey. These poisons that are being sold in stores in Italy have been banned for sale in the United States because they poison wildlife, pets, and children. Trash on the ground, open trash containers and dumpsters supply food to the rats and mice! This is the problem to be solved. All holes in buildings MUST BE SEALED COMPLETELY so mice cannot get in. Closed trash containers and dumpsters SOLVES the problem. Rats and mice have nothing to eat. This is how mouse and rat problems are stopped. I work on a small military base in the Inland Empire and am trying to convince authorities here to stop poisoning the ground squirrels. Does your organization provide direct assistance in situations like this? Can you contact me. I’m trying to do something about rodentcide in Santa Monica, Thank you, keep up the good work. Hi guys. What can you tell me about P.C.Q. The Rancho Simi Recreation and Parks district is using it. They claim it isn’t an anti-coagulant. Thanks in advance. Disappointing. It is one of the standard anticoagulants – diphacinone. How are they using it? In the bait boxes? Or just put into holes? Or in the ground? Diphacinone is a major poisoner of bobcats, mountain lions, and whoever else eats the squirrels or other rodents. 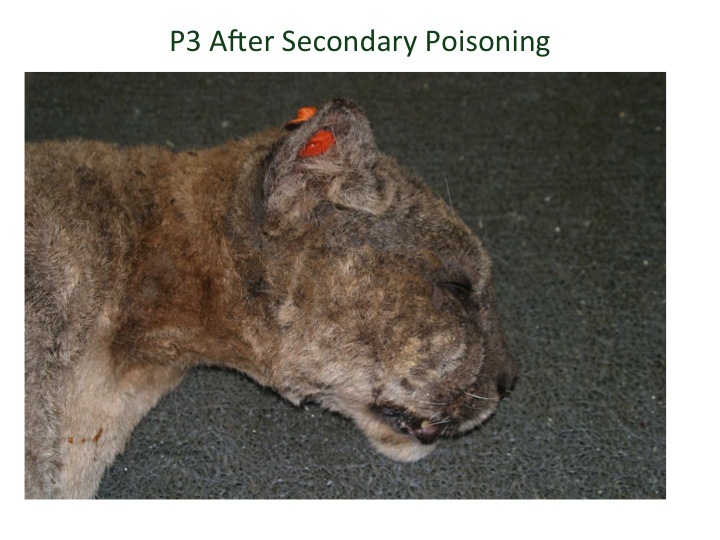 It was found to be poisoning Griffith Park mountain lion P-22 (who was rescued) and contributed to the deaths of P-34 in Newbury Park and P-41 in the Verdugo Hills. Dogs are also a major victim, as they gobble it up. Please see other parts of our website that mention diphacinone. The Conejo Valley Park District uses NO anticoagulants and Simi Valley should do the same. Please email us at PoisonFreeMalibu@gmail.com if you learn more. I’ve used it before when I was working for pest control company. I would consider it the same as rat poison. PCQ doesn’t brake down as simple as they claim. Plus it very poisonous ☠️ to anyone in contact with the product. How do I report a company who continues to uses rat poison and has unlicensed workers? Thanks for the note. Where are you? Malibu? Amazing that the guy admitted that he was not licensed. That is a huge no-no. It is not the city’s direct responsibility, although they should direct you to the proper office. The place to report this is the Los Angeles County Agriculture Commission. They oversee pest control operators. The other alternative is the California Department of Pesticide Regulation https://www.pestboard.ca.gov/. They are the ultimate governing body. See the Enforcement/Complaint phone number there – 916-561-8708. We would very much like to know what you find out. Please let us know. Thank YOU! All of this information is exactly what I have been looking for! Where can I dispose of rat poison traps left in my neighborhood? Hi Mary, This very much depends on where you are and your local government. Here in Los Angeles County rat poison is the most hazardous of the hazardous waste. There are a small number of places it most be brought to. Please call or email your city or county government office to ask them. Definitely do not put it in normal trash! Do you know what time the meeting is tonight in Chatsworth?